Send money to almost anyone with an email address using your PayPal balance, bank account, or credit card Need Assistance? 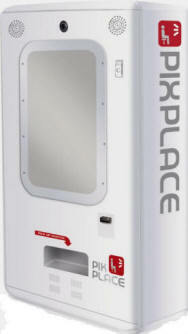 Face Place Deluxe Photo Booth - Very simple design, very easy to operate and a very affordable price comes with the most reliable photo booth to hit the market in ages. The advanced electronic design means no easy to break pc's, printers or hard drives in this machine, and that means no system or hard drive crashes. Movie lovers will be running to the new Face Place Movie Photobooth. With films such as Wonder Woman and The Lego, Batman Movie, you will have families lining up to get their photos taken. 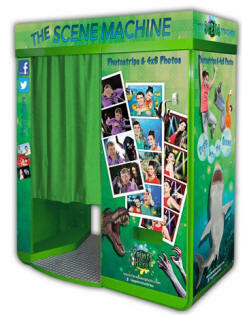 The Movie Scene Photobooth embraces green screen technology to deliver an interactive photo booth experience like never before. Users are �dropped into a �Movie scene� of their choice. The selection of Hollywood blockbusters is constantly updated and provided by major Hollywood Studios such as Sony and Warner Brothers! 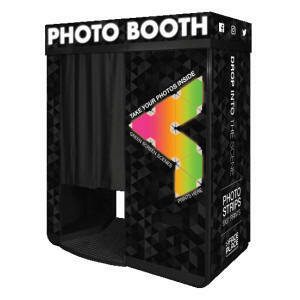 Very simple design, very easy to operate and a very affordable price comes with the most reliable photo booth to hit the market in ages. The advanced electronic design means no easy to break pc's, printers or hard drives in this machine, and that means no system or hard drive crashes. Dispenses four 2" x 2" wonderfully detailed and practically indestructible traditional black & white photos, or can be set to print an additional top or bottom frame for use with your advertising campaign, custom marketing message or company logo. 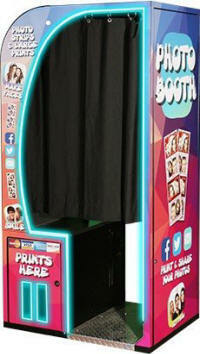 Great for trade shows, events and high-volume usage, as prints from this great booth takes just 15 seconds to print out. 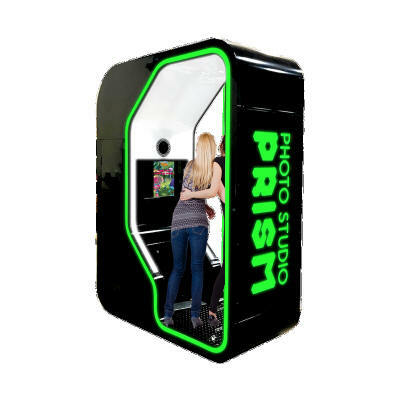 The Photo Studio is the world's most interactive photo booth experience! Introducing Photo Studio Prism, a compact and smaller version of the Photo Studio Deluxe to fit within more locations. Customers can enjoy 20 interactive videos and pose within fun scenes or �BeScene�. 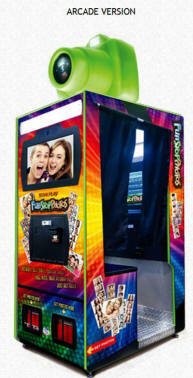 Fun Stop Photos™ is sure to bring fun and excitement to any location! 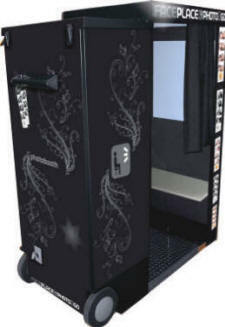 Both the “Party like a Rock Star” Arcade photo booths and the elegant "Tuxedo Black" Event photo booths take pictures inside and outside the photo booth, AT THE SAME TIME! 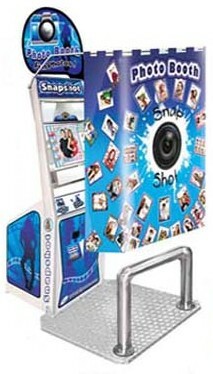 Having a Fun Stop Photos™ photo booth ensures that everyone gets in on the fun! Experience the excitement of seeing your face on the cover of a magazine. Simply choose who you want to be and where you want to be and like magic, you're a famous celebrity on the cover of a magazine. Show it to your family and friends. A bit of nostalgia, a bit of tomfoolery, Magazine ME is the perfect photo machine for everyone who enjoys remembering a good time. Perfect for Malls, Shopping Centers, Resorts, Amusement Parks and wherever crowds congregate. Why not go BIG? 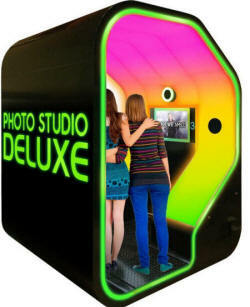 The Photo Studio Deluxe is the world�s most interactive photo booth attraction. Its monumental size and vibrant light show composed of over 5,000 LED lights will undoubtedly be an eye catching attraction for any FEC. 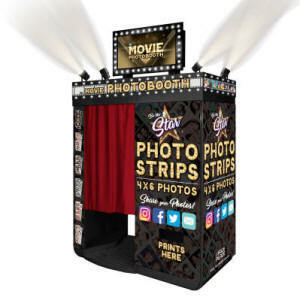 With state-of-the-art retro-reflective technology, large groups of people can enjoy 20+ video-guided interactive fun scenes or �Be Scene� in a custom �One-Step� step and repeat promoting your brand. 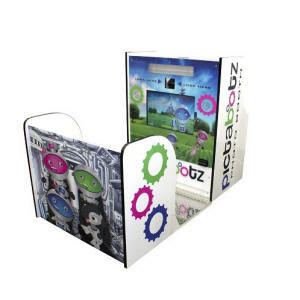 Pictabotz is the world�s first interactive photo experience for children. It�s a fully animated social and active experience that will bring the whole family together. Follow the Pictabotz poses and start your journey today! remote monitors. Create videos with voice messages. Connect to social networks. Collect email. Choose your photo format...PIX PLACE has it all. If your location is thinking about tomorrow, think PIX PLACE. 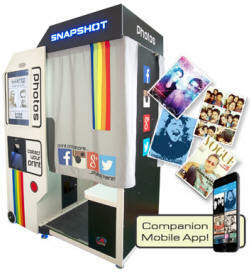 and hardware as all our other photo booths. 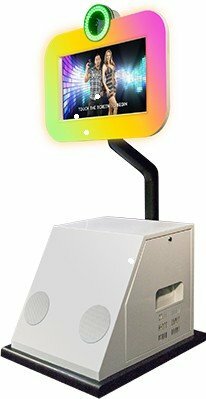 Apple Sapphire Photo Booth - Apple�s newest digital photo booth, the Apple Sapphire Photobooth is known for its cool looks and very eye-catching overhead sign ! The Apple Sapphire is constructed with a rugged, all-steel cabinet, and its beautiful retro look makes it the perfect addition to nightclubs, bars, bowling centers, resorts, malls, retail stores, theaters and even for home use. 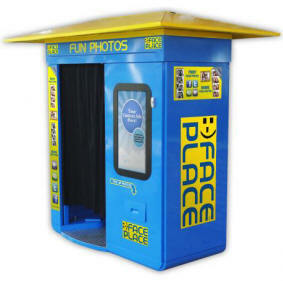 The Face Place Scene Machine embraces green screen technology to deliver an interactive photo booth experience like never before. Users are "dropped into a scene" of their choice, ranging from scary scenes with vampires and dinosaurs to underwater scenes where they can swim with all types of fish! Customers can also visit popular tourist areas like the Statue of Liberty, the Las Vegas Strip, and he White House. 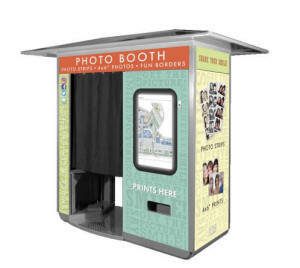 Of course, like our Face Place booths, the Scene Machine also takes advantage of our cutting edge Smile 2.0 software that allows customers to share their photos on Facebook, Twitter, of by e-mail directly from the booth. 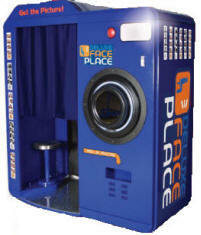 The Face Place Scene Machine 2 embraces green screen technology to deliver an interactive photo booth experience like never before. Users are �dropped into a scene� of their choice, ranging from scary scenes with vampires and dinosaurs to underwater scenes where they can swim with all types of fish! Customers can also visit popular tourist areas like the Statue of Liberty, the Las Vegas Strip, and the White House. Take a selfie, decorate, and impress your friends with Snapshot 2! The colorful and attractive cabinet graphics of Star Blitz/Snapshot will entice your guests to "Strike a Pose" with every visit and that's just the start of the fun! With 3 different "Pose Modes" and countless ways to edit, customize and accessorize their pictures, your players will enjoy an almost limitless number of ways to create memories! 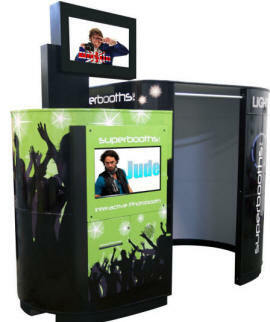 Superbooth has created the world’s first interactive photo booth. Unlike any other product in the market today Superbooth includes superb surround sound, pulsating lights & a high powered studio fan – for that all important glamour fashion shoot feeling..! Players watch the 42” LCD screen where one of five fun and funky photographers will provide instructions on how to pose. will make the most important event of a lifetime even more special. It's absolutely beautiful, with white and silver upholstered trim, and will capture the most memorable photos that will last a lifetime for your client. 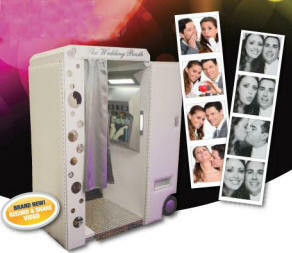 Nothing will rent easier or make your company stand out more in a crowded field than the Face Place Wedding Booth. Adrenaline Amusements - American Changer - American Alpha - American Retro - Andamiro - Apple Industries - Arachnid - Aramith - AxesNetwork - Barron Games - Baytek - Benchmark - Betson - Bob's Space Racer - Champion Shuffleboard - Chicago Gaming - C. L. Bailey - Coastal Amusements - Coast to Coast Entertainment - Connelly Billiards - Cornilleau - Design Plus - Dynamo - Escalade Sports - Falgas - Family Fun Co. - Full Swing Golf - Fun Industries - Fun Company - Fusion by Aramith - Five Star - GEO Productions - Gold Standard Games - Great American - GlobalVr - Hantle ATM - Hercules Networks - ICE - Impulse Industries - Incredible Technologies - InJoy Motion - Jennison - Jersey Jack Pinball - JVL - Kalkomat - Klopp Coin - LAI Games - Medalist - MEI Group - Merit - Morgan Cycle - Namco - OK Mfg - ParSal Vending - Penny Press - Punchline Games - Quasimoto - Raw Thrills - Rock-ola Jukeboxes - Sega - Shelti - Simuline - Skeeball - Smart - Sports Fan Products - Standard Change-Makers - Stern Pinball - Team Play -Tornado - Touchtunes - Triotech - USA Gaming Supply - Valley - Vendever - Wurlitzer - and more. Contact our corporate office at 1-205-324-7526 or email for details. or download problems you had while using this Web site.